Polish warmblood; 16.1hh Black Tobiano mare; CHAPS Reg. 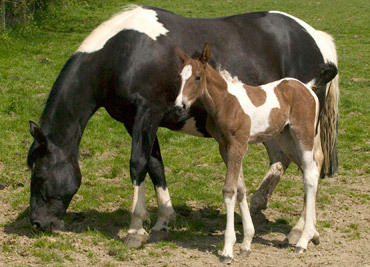 This quality coloured mare has consistently produced top foals. Her foal, La Premiere was CHAPS National Foal Champion in 1999; her 2000 foal, Cutsdean of Centyfield, is a graded CHAPS stallion. Her 2007 foal, Cutsdean Windrush has been very successful in the show ring, qualifying for the R.I. (see competing).